We offer different payment paths to your Aquanimous Yoga experience. Learn about your choices below and make a selection when you sign up for class. Dhamma Phala Vipassana Meditation Philippines. benefit other people in finding real peace, love, happiness and liberation. *Can be purchased as a Gift Certificate. *Please note that a 5% fee is charged for online payments. 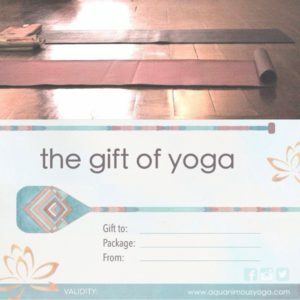 Purchase these Passes as a Gift Card at our studio or buy an eGift to print or e-mail. Kindly indicate this upon purchase so we can either give this beautiful gift card to you or e-mail it to your loved one. They will just have to present it to us on their first day of class to complete their registration.